I’ve been pretty clear in my love for Swagbucks. I’ve used it for years and continue to earn all kinds of rewards and PayPal cash just from doing things online that I’d do anyway, like shop. Swagbucks is hailed as one of the best rewards sites because it really is a great way to earn money, gift cards, or other rewards quickly online. You can read our Swagbucks review to learn more about it and why I love it so much. But, I’d be lying if I said I didn’t use some other rewards sites too! With so many great ones out there, why limit yourself to just one? After all, the more you use, the more you can make, right? 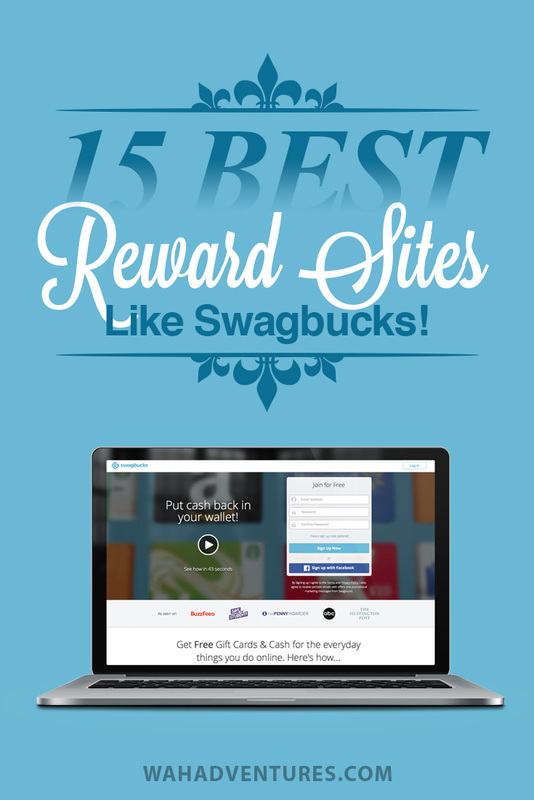 Here are a few of my favorite rewards sites similar to Swagbucks – and they’re all legit. InboxDollars is my close second pick behind Swagbucks. Because out of any rewards sites that I’ve used, it’s the one most like Swagbucks. And, it’s the one I’ve made the most money from. I’ve been a member of InboxDollars for years, and when I use it consistently, I make money easily there. You make money in many of the same ways as Swagbucks. Play games, take surveys, read paid e-mails, search the web, complete offers, and more. There are plenty of free offers to choose from, which I like. You can cash out your earnings via a check, gift card to tons of top retailers, or a Prepaid Visa card. You need at least $30 in your account to check out. InboxDollars gives you an easy $5 just for signing up, so it won’t take you long to get to $30! InboxDollars is open worldwide to those 18 or older. Ebates isn’t an all-around rewards site; instead, it focuses on rewards from shopping. But, for those who use Swagbucks mostly for its cash back shopping offers, Ebates is a super-close runner-up. It actually offers some better cash back shopping opportunities than Swagbucks! Plus, you can receive a $50 bonus just by referring two friends to Ebates. That alone may be worth a sign up if you think you can get some friends on board! All they have to do is make their first purchase with Ebates and you get the bonus. Cash Crate is actually one of the first rewards sites I ever joined. I never had much luck with it, but then again, I also didn’t spend a lot of time with it. However, I’ve heard from several people who swear by it that it’s a great way to earn some extra cash. One of the best ways to earn money through Cash Crate is by completing cash offers. Of course, you’ll need to spend money to earn money this way. But, if there’s something you wanted to buy anyway, you’ll get cash back for it. Cash shopping works similarly. Shop specific stores that participate in the program and you’ll earn a certain percentage of your purchase back. You can also take surveys, play games, and earn money for referrals. The Cash Crate referral system is one of the best, offering up to 30% of your referrals’ earnings. The program is tiered, so you’ll earn from your referrals, and their referrals, and so on. You must be at least 13 to participate. Join CashCrate here or read the review. PrizeRebel is a rewards site open to members worldwide, 18 or older. Those in Australia, UK, U.S., and Canada appear to have the most success with the site. You can earn points from paid tasks, surveys, videos, offers, raffles, contests, games, and more. Prize Rebel has a unique leveling system that rewards members for staying active. When you reach a new level, you can earn rewards claim codes for great prizes. You can redeem your points balance for PayPal cash or one of a huge selection of gift cards, like iTunes, Walmart, or Amazon. You only need a minimum of $5 to cash out. You can earn up to 30% of what your referrals earn, depending on your current level. This program originally started to earn you cash by searching with Bing. Now, it’s a whole different program with plenty of ways to earn money and other rewards. Bing Rewards gives you rewards for just about anything you do with your Microsoft account. Search the web, download and install apps, complete daily offers, and more. The program also offers cash back rewards through shopping, much like Swagbucks does. It even gives you credits for “active browsing”, which basically means active use of the Microsoft Edge browser. You can check e-mails, surf the web, and anything else that requires the use of Microsoft Edge. You can move up through its levels to gain points bonuses and discounts on rewards. You’ll need to remain active to keep your level status, though. Rewards include a variety of gift cards, like Amazon, Hulu, and the Microsoft Store, charitable donations, and sweepstakes entries. You’ll need to be 13 or older to join and participate in Bing Rewards. ClixSense offers all the basics of a rewards site: complete free and paid offers, take surveys, shop online, participate in contests, refer others, and more. You can also get paid to view and click on advertisements, but the pay for these is low. You’ll usually only get a penny or two per ad. The best way to earn money through ClixSense is with surveys that pay up to $5 each and usually only take about 10 to 15 minutes. You can earn some money from referrals, too, but only after they start earning some money through ClixSense. So, if you refer people who never intend to use the program, you won’t get a cent from them. But, there are plenty of other money-making opportunities on ClixSense – they’re just a little slower to earn from than some other websites. Clixsense is open internationally to those 16 or older. Get Paid is a lesser-known rewards site, but it has some decent reviews floating around the internet. Users say that it pays quickly and is fairly easy to earn extra points each week. One of the most popular ways to earn points through Get Paid is by clicking advertisements. But, you can also earn points through surveys, offers, watching videos, making referrals, and more. Users do say that, although Get Paid is available to several countries, most of the offers are only for USA, UK, or Canadian members. So, keep that in mind if you’re from a different location. You can earn more through the Get Paid leveling system, which gives you bonus points as you level up. GiftHulk is a newer reward program, but it’s quickly gaining some popularity. Currently, it’s only open to those in the United States, Canada, UK, Ireland, Germany, Australia, and New Zealand. Instead of earning cash through GiftHulk, you get Hulk Coins to later redeem for cash and prizes. When you sign up and verify your e-mail address, you immediately get 250 Hulk Coins. You can then earn more by completing surveys, searching the web, playing games, watching videos, and referring friends. GiftHulk occasionally has bonus tasks that will pay its users extra, like writing a quick blog post. You can turn your Hulk Coins into cash through PayPal, or redeem them for one of several gift cards. Gift Hunter Club seems like a barebones rewards site, but it offers just about everything you’d expect from one. You can earn rewards by completing offers, watching videos, taking surveys, and doing microtasks. One fun way to earn some extra points is by listening to the radio! The referral program is good, too. You can earn 10% on all your referrals earnings through the tiered program, plus a 50-point bonus when your referrals collect their first 50 points. If you have an Android device, you can also download the Gift Hunter Club app to earn rewards on the go. The minimum points you need for rewards is 250, which will get you a $2 PayPal gift card. Or, save up to earn Amazon and other gift cards. GrabPoints is super focused on its mobile app for iOS and Android users, but it does offer its program on the website, too. GrabPoints mostly has free and paid offers. You might need to check out an advertiser’s website, watch a video, download an app, or make a purchase to earn points. You can also complete surveys, although the pay range for them is quite low. You can also share GrabPoints with your friends on social media to get them to join. You’ll earn bonus points for referrals, and even more once they make a purchase or earn a certain number of points. Redeem your points for PayPal cash or a variety of gift cards, like BestBuy.com, Walmart, and more. InstaGC is a rewards site that offers over 360 gift card brands to choose from! This site is open to members worldwide who are at least 18 (or younger with parental permission). You can earn points to exchange for gift cards by taking surveys, referring friends, participating in trials, visiting websites, watching ads, searching the web, and more. InstaGC partners with Crowdflower, too, to give its members microtasks to earn more. These are quick tasks, like data entry or quick researching. Admins will sometimes create point booster codes for members that they can redeem for extra bonus points! MintVine partners with tons of top survey research sites, like Harris Poll and Nielsen, to provide several survey opportunities for members. You can instantly earn 200 points (the equivalent of $2) just for signing up. MintVine is mostly a survey site, but there’s also rewards for daily polls, local deals, and for referring your friends. You’ll earn 50 points when your friend takes his first survey, plus 15% on all referrals’ future earnings. Shop with MintVine to earn cash back offers from participating partners. You can find current offers in your dashboard. MintVine is currently open to those in the U.S., UK, and Canada, at least 13 years old. Points2Shop is one of the largest rewards sites where you can earn points from all the things you’d expect: take surveys, complete offers, watch videos, play games, and more. One of the most popular money makers on Points2Shop is its paid offers. There’s usually several to choose from, and it’s a good way to earn some points from things that interest you. The games feature on this site is different than most. You can bet your points; if you win, you keep all your competitors’ points! It’s a great way to earn points quickly if you’re awesome at certain games. The referral program is good, too. Earn $1 for U.S. and UK referrals and then continue to earn 15% of their lifetime earnings. Points2Shop is open to worldwide members, but those in Canada, UK, and U.S. tend to have the most offers available. You must be at least 18, or 13 with parental consent. There are mixed reviews on SendEarnings, but the reward site seems to work well for many, so it’s worth a mention. SendEarnings is managed by the same company that runs InboxDollars, so it works similarly. You’ll get rewarded for reading e-mails, completing offers, taking surveys, playing games, shopping online, and more. One unique feature is the ability to earn points from using the coupons you find on SendEarnings. Print the coupons you want to use, and when you redeem them, you earn cash back to your SendEarnings account. Like InboxDollars, you need a minimum of $30 to cash out with a check or Prepaid Visa. You need to be 18 or older to use this rewards site, but it’s open to worldwide members. Treasure Trooper is another rewards site that I’ve been involved with for a few years. It’s a bit slower to earn money from than InboxDollars and Swagbucks, but I complete a couple of things every day or so in my spare time to earn some extra cash. This one is open worldwide to those 13 or older, but again, U.S., UK, and Canada residents tend to have the most earning potential. Treasure Trooper offers the usual: paid surveys, games, offers, cash back shopping, and referrals. I use it most for surveys and offers. You can take up to eight new surveys a day, and some pay $1 or more. Treasure Trooper also offers a unique way to earn a quick payout with Cash Calls. You’ll need to provide your phone number for advertisers to give you a quick call, but if you don’t mind listening for a few minutes, you can earn a quick buck or two. It’s hard to beat Swagbucks. If you’re looking for a rewards site better than Swagbucks, you’ll probably be disappointed. Still, these options are great ones to join in addition to Swagbucks. They all offer something a bit different, so you can really maximize your earning potential by using a few that you like the most. Rewards sites won’t pay all your bills, but they can help. Use them in your spare time and remember to check your e-mail daily. Most rewards sites send out e-mails every day or so updating you on their newest offers, surveys, and more. Get to the surveys as quickly as possible, because once they fill up, you’ll miss the opportunity to take them. Do you use any rewards sites that aren’t on this list? Be sure to share them with us in the comments! We always love checking out the newest money-making opportunities and sharing them with our readers. How Does an Extra $500 a Year Sound to You? Awesome list as always Amy! Thanks for putting this together. You know I’m passing this along.